You must have heard about the tecno "CAMON CX AIR" When ever we hear the name tecno camon the first thing that comes to our minds is the camera. the camon series has two powerful things the battery and the camera. But the Tecno "L" series are not also left out as Tecno L9 Plus smartphone contains a 5000 mAh battery capacity that can serve for days, also with fast charge 1.0. The first of the L series with monster of 5050 battery is the TECNO L8 and L8 plus. It is no longer news that Tecno’s line of L series smartphones usually come with big battery capacity and also their line of Camon series do come with high camera quality. 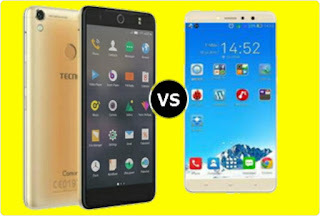 Today, we are going to be comparing one of Tecno’s best L series devices Tecno L9 Plus with one of their best Camon series device Tecno Camon CX Air, so you can easily weigh options when choosing between these two wonderful Tecno devices. 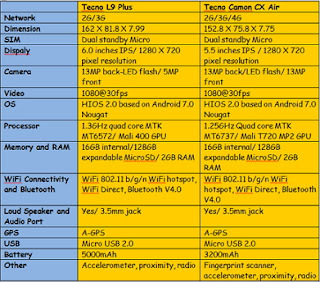 The comparison between Tecno L9 Plus with Tecno Camon CX Air is simply a case where a battery centric device locks horn with camera centric device from the same manufacturer. And the good thing between both devices that even elicit good comparison between them is that both devices even fall within similar price range. Tecno L9 Plus is currently selling for $130 (N56,000) and while Tecno Camon CX Air is selling for $122 (N44,000). The both device are worth killing for so you can easily make your choice on which one to go for as you do know that to get any of the device your money must speak for you!! !